The 12K combines first-class performance with incredible versatility to create a system that’s easy to operate, yet feature-packed. Equipped with the T-FHSS protocol, the 12K is compatible with T-FHSS telemetry sensors (sold separately). In addition to telemetry, the 12K can be used with S.Bus 2 gear to add multiple servos, gyros and more to set-ups with fewer cables. Pilots with non-telemetry set-ups can take advantage of the S-FHSS protocol. 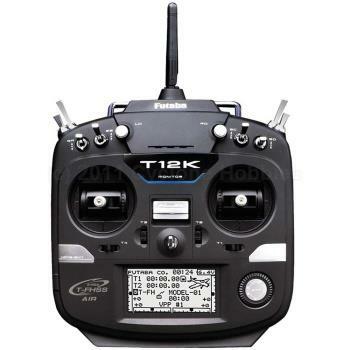 A large, backlit LCD screen, expandable 30-model memory, a 6V 1800mAh NiMH transmitter battery and charger are just a few more of the features the 12K has to offer.